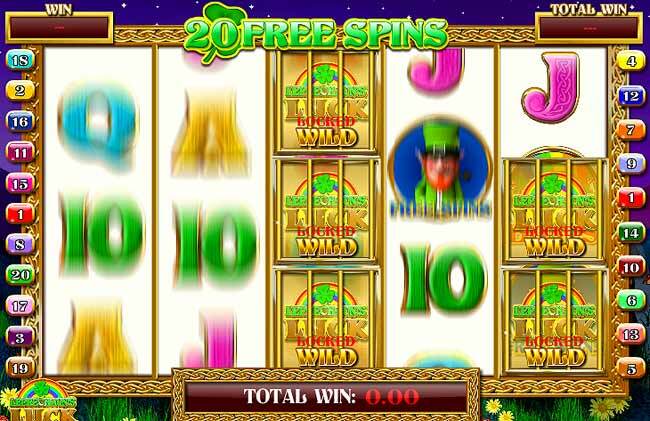 Find the luck of the Irish and win a huge jackpot with this new game from Playtech and Ash Gaming. This is a fullon jackpot slot machine with some big money up for grabs. A five reel slot machine with 20 paylines awaits you. The game is also teeming with great bonus features to win extra rewards. There are WILD, BONUS, FREE SPINS and WISHING WELL symbols that all activate extra bonus features. The reels show typical irish luck items such as four leaf clovers, golden harp, toadstools and pints of guinness. Choose your bet amount and spin the reels to get a winning symbol combination on one of the 20 paylines. With four special symbols to look out for a big win is never far away. The first bonus game is the FREE SPINS. Get three or more FREE SPINS scatter symbols on the reels to begin the free games. 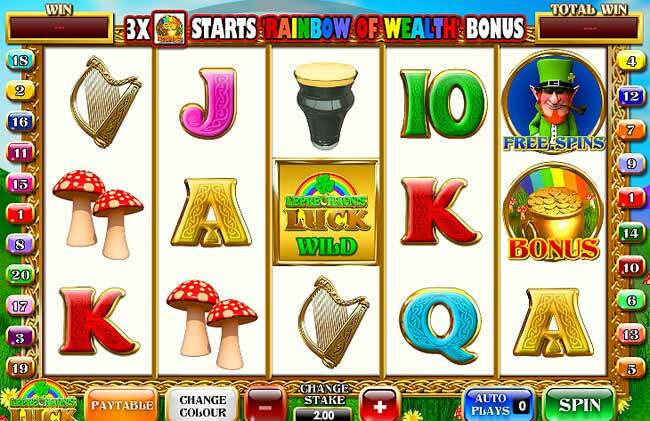 You are awarded free games according to the smoke appearing from the leprechauns pipe and can get up to 30 free spins. Also, during the free spins you will notice the Leprechaun casts his magic on several symbol positions making them LOCKED WILDS. The main bonus game is activated with three or more BONUS scatter symbols. 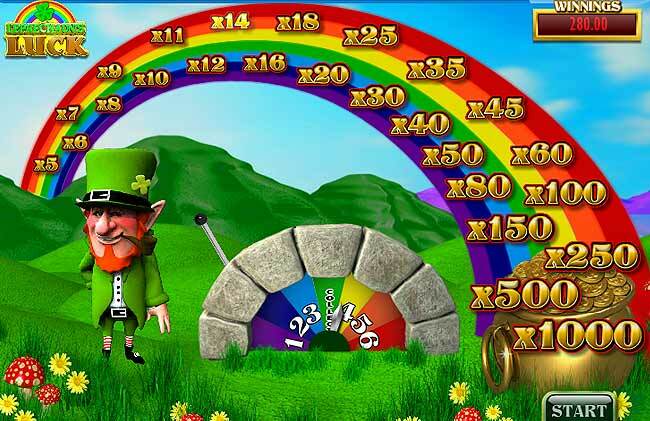 This is a simple game where the leprechaun pulls a lever and the winning number is marked on the multiplier rainbow ladder. Keep climbing the ladder and increasing your win multiplier until you hit collect. This can give up to 1000x your total bet as an instant cash prize. The final bonus feature is the wishing well bonus. If a wishing well symbol appears on the center reel at any time the WISHING WELL bonus will start. The bucket lowers down the well and collects prizes as it drops. Keep filling the bucket with cash until it reaches the bottom. This is a fun game with three reat bonus features that appear frequently and often payout big cash prizes. The Irish theme is fun and the little leprechauns cheery irish voice helps you along the way. You can play this game today in all good online casinos, our choices are Casino Tropez, Titan Casino or Casino.com. Click the "PLAY NOW" button below to play for real with a huge free spins and cash match welcome bonus.